Carl Linnaeus, aka Carl von Linné, or Carolus Linnaeus (1707-1778) was the son of a Lutheran pastor in Sweden. His father taught him to love the identification of plants. So influenced to appreciate nature, Linnaeus studied and became a medical doctor. However, at every step he was quickly recognized for his outstanding abilities in the systematic study of nature. 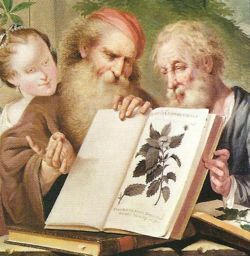 He became a professor at Uppsala University, first in practical medicine, but then he traded for another position in the university to become a professor of botany. This was perfect for him. He was a good teacher and had many students. He took his students on field trips and even sent them to other lands to find specimens. He married and had five children. He appointed his son to be his successor. After Linnaeus died, his widow, needing money, was forced to sell his library to the Linnean Society, founded in 1788 in London. It is still preserved there. Believing the Genesis account of Creation in the Bible, Linnaeus made it his goal to identify the original "kinds" that God had made. Assuming that God would be orderly, he viewed the creatures as "pearls on a string" and established a system of classification for plants and animals that is still used. Each species was given a Latinized name (written in italics or underlined) in what is called "binomial nomenclature" and then fit into ever larger groupings that subsumed the groups below. How the system works can be seen when one considers the scientific names of wolves and dogs. The species name of the grey wolf is Canis lupis, the red wolf is Canis rufus, all the domestic dogs are Canis familiaris (Some believe the domestic dog is the same as the grey wolf, Canis lupus), the coyote is Canis latrans. One can see that the genus Canis includes animals that are judged to be separate but quite similar. Canis joins Homo at the class, mammalia because both feed milk to their young. Linnaeus praised the Lord for what he observed in nature. His approach was to start with the observations and then to end by praising God. At the end of his life Linnaeus did not believe that he had actually identified the Biblical "kinds." While he felt that he had made progress, his concept of "species" did not equal the "kinds." However, his system of naming and grouping earned him a lasting place in the history of science. Linnaeus relied on observation of physical forms. Today DNA sequencing is bringing new information about similarities among plants and animals that he would have enjoyed. The definition of what a species really is remains a problem in taxonomy. ↑ "The Legacy of Linnaeus" Nature 446, 7133, March 15, 2007, p. 231. ↑ "The Species and the Specious" Nature 446. 7133, March 15, 2007, p. 250-255. This page was last modified on 1 July 2016, at 10:23.